In a distributed cloud environment, tenant and system is increasingly important part of the online security. If an attacker gains access to your virtual machines, they can get control of most running applications, local data as well as its connected machines and systems. The Vault SSH secrets engine provides secure authentication and authorization for access to machines via the SSH protocol. It supports signed SSH certificate and one-time SSH password modes. This guide demonstrates the one-time SSH password mode. By default, SSH servers use password authentication with optional public key authentication. If any user on the system has a fairly weak password, this allows an attacker to hijack the SSH connection. Vault can create a one-time password (OTP) for SSH authentication on a network every time a client wants to SSH into a remote host using a helper command on the remote host to perform verification. An authenticated client requests an OTP from the Vault server. If the client is authorized, Vault issues and returns an OTP. The client uses this OTP during the SSH authentication to connect to the desired target host. When the client establishes an SSH connection, the OTP is received by the Vault helper which validates the OTP with the Vault server. The Vault server then deletes this OTP, ensuring that it is only used once. Since the Vault server is contacted during SSH connection establishment, every login attempt and the correlating Vault lease information is logged to the audit secrets engine. To perform the tasks described in this guide, you need to have a Vault environment. Refer to the Getting Started guide to install Vault. NOTE: For the purpose of this guide, you can use root token to work with Vault. However, it is recommended that root tokens are only used for initial setup or in emergencies. As a best practice, use tokens with appropriate set of policies based on your role in the organization. The SSH secrets engine uses Vault SSH Helper to verify the OTP used during the SSH authentication. Therefore the helper agent must be installed onto every target host. Download and install the latest version of vault-ssh-helper from releases.hashicorp.com. Create a Vault SSH Helper configuration file, /etc/vault-ssh-helper.d/config.hcl. Where the <VAULT_ADDRESS> is the address of the Vault server generating the OTP. Refer to the documentation for the entire list of configuration properties. NOTE: common-auth is the standard Linux authentication module which is commented out in favor of using our custom configuration. Refer to the documentation for details about these parameter settings. This enables the keyboard-interactive authentication and PAM authentication modules. The password authentication is disabled. This step must be performed on all target hosts that you wish to connect using the Vault's one-time SSH password. On the Vault server, you must enable the SSH secrets engine before you can perform the operation. Then you are going to create a role named, otp_key_role. First, enable the SSH secrets engine. This creates otp_key_role with ubuntu as its default username for which a credential will be generated. Where <TOKEN> is your valid token, and <PARAMETERS> holds configuration parameters of the secret engine. The following example enables SSH secret engine at sys/mounts/ssh path, and passed the secret engine type (ssh) in the request payload. 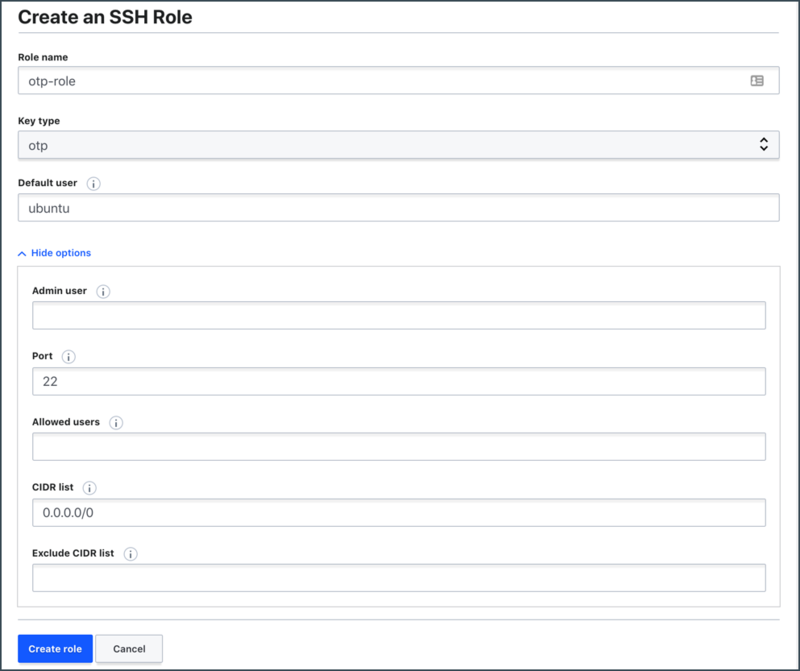 Now, create a role using the ssh/roles/otp_key_role endpoint. Select Enable new engine and select SSH from Secrets engine type drop-down list. Enter otp_key_role in the Role name field, select otp from the Key type drop-down list, and then enter ubuntu in the Default user field. Select More options to expand the optional parameter fields, and then enter 0.0.0.0/0 in the CIDR list field. NOTE: Its recommended to create individual roles for each username to ensure absolute isolation between usernames. This is required for Dynamic Key type and OTP type. For the purpose of this guide, the cidr_list will be set to 0.0.0.0/0. For production, be sure to set this parameter to be as granular as you can since there is no need to keep this role open to the world. The client must have the following permission to request an OTP for otp_key_role. The key value is the OTP to use during SSH authentication. Select ssh under Secrets Engines. Select otp_key_role and enter ubuntu in the Username field, and enter the target host's IP address (e.g. 192.0.2.10) in the IP Address field. Click Copy credentials. This copies the OTP (key value).